BEE is an enriching introduction into environmental science taught by Guadalupe River Park Conservancy’s environmental educators. This is a free, drop-in program and pre-registration is NOT required. Guardians must stay with their children and are responsible for their behavior for the duration of the program. BEE is offered in English on Wednesdays, and in Spanish (with an English-speaking aide) on Fridays. Click here for the BEE flyer. BEE happens rain or shine. 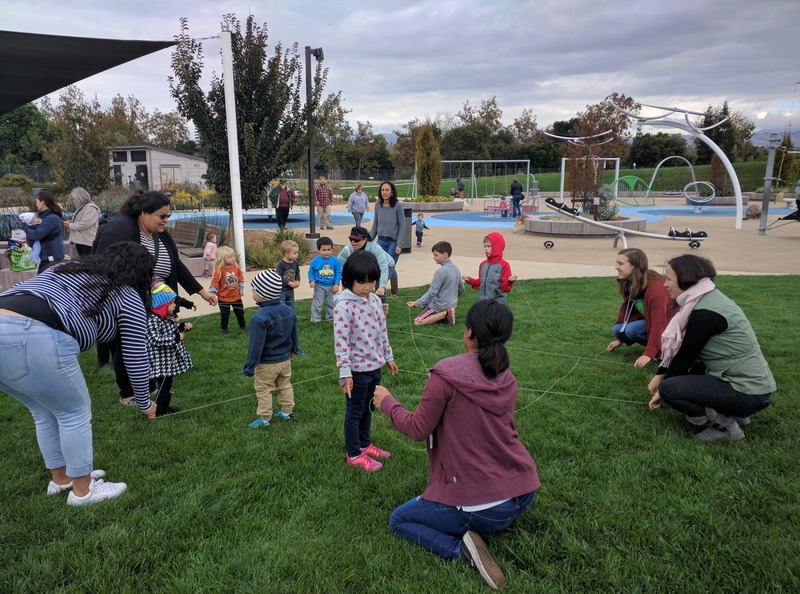 The program is usually held at the Rotary PlayGarden amphitheater, but in inclement weather, the program will be moved indoors to the Guadalupe River Park Conservancy Visitor & Education Center located at 438 Coleman Avenue San Jose, CA 95110. Stay updated on themes and weather notifications by “liking” us on Facebook. BEE is specially designed for children ages 2 – 6. Lessons are specifically written to build on milestones of this age group taking into consideration cognitive, linguistic, social, and life skill development. What are the classes about? Topics are thematically chosen to correlate with current environmental changes and holidays. BEE instructors will have a sign-up sheet available at 10:45am in the Rotary PlayGarden Amphitheater. Sign-ups will be taken for that day’s program on a first-come, first-serve basis. All parties in a group must be present to register on the sign-up sheet. We cannot accommodate single groups (preschools, daycare providers, etc.) with more than 10 child participants. After 25 participants have signed up, registration will close and a “Class Full” sign will be displayed. No additional BEE participants will be permitted once this sign is posted. We will not have live animals in our programs unless we explicitly say so. However, all are welcome to visit our live, educational animal ambassadors at the Guadalupe River Park Conservancy Visitor and Education Center Monday – Friday from 9:00 AM – 5:00 PM. Want to join in on the BEE fun?